OrthoGraph I, our multi-platform floor plan app has been launched in September 2016 and by now it has reached 30.000+ downloads. Reaching this fantastic goal in such a short time proves to us that there are many professionals who can benefit from our building survey app. To help the conversion from pen and paper to the digital world we decided to give a gift to those who are interested in working with OrthoGraph I. An OrthoGraph I gift to you! All who sign up now for a new monthly OrthoGraph I subscription before 30 June will get 50% off from the monthly fee. Furthermore, if you sign up on our webpage, and you choose the auto renewable option, you will get 50% off from the monthly fee as long as you stay subscribed. This means if you get onboard with OrthoGraph I now, you can benefit from the discounted monthly fee even after the promotion is over. What do you get with an OrthoGraph I subscription? There is more! Be a VIP member of OrthoGraph I's community! If you subscribe, you get additional benefits in addition to your full-functionality OrthoGraph I: You will be a VIP member of OrthoGraph I’s community. We are committed to provide professional support for our users, so we built an ever-growing Knowledge Base. You can reach it by clicking here or directly in the app - tap on the big question mark button in the app and get all the info you need about OrthoGraph I. Browse our guides and tutorials, get info about OrthoGraph I features, supported formats and devices, and if you miss something just ask us and expect a rapid answer. If you have an OrthoGraph I subscription, then you can use the Knowledge base as a VIP member. What does this mean? Do you have any question about OrthoGraph I? Ask us live on our Q+A event! Sign up today for the event and get a chance to win an OrthoGraph I subscription with a Leica DISTO D2. Furnish your OrthoGraph I floor plan with 100+ BIM models and export your work in industry standard file formats - IFC, DXF - without limits. From now on, every object has an accurate DXF model. Our professional building survey app, OrthoGraph I is a native BIM App by design. The software handles several BIM (Building Information Modeling) properties, such as complex hierarchical location structures, doors and windows with opening directions and unlimited number of properties. Moreover, you have 100+ intelligent objects to represent the equipment and machinery of the built environment. All this complex BIM data can be exported into IFC and DXF files, which can then be used in several CAD and BIM software platforms. From now on, every BIM element you add to your drawing, will have a corresponding DXF block representation. This means that objects in exported DXF files are no longer shown as a generic placeholder symbol, but an accurate 2D representation of the model. Up until now, measurements done in OrthoGraph I appeared as blocks in the DXF file. From now on, the measurements are recognized as native CAD dimensions, which correspond with the dimension styles you have set up on your CAD software. Furthermore, we fixed an issue where certain measurements in DXF files would be imported in metric, even if the app was set to imperial. Download the app today and make professional floor plans in minutes! Have you ever thought about managing a complete building survey without pencil and paper? Would you try something, which is much faster, easier and more accurate than everything you have ever used? Would you spare time and money with an innovative technology? 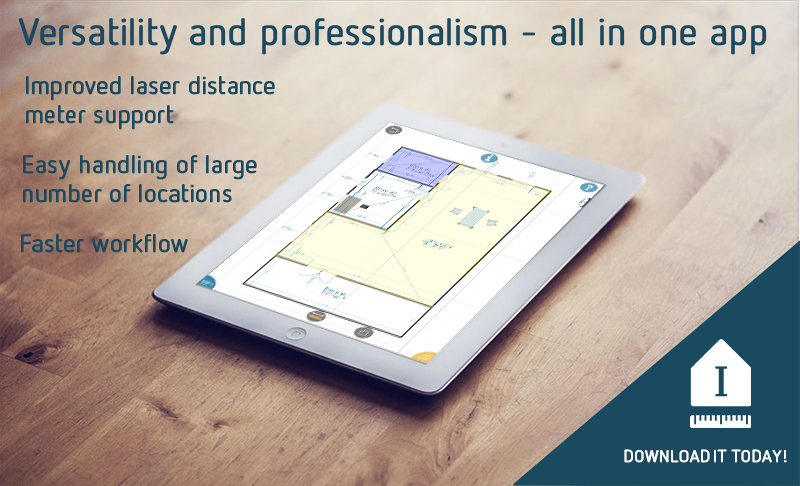 Then download OrthoGraph I’s new version, which provides you with all features you need to make a professional building survey. Get a detailed floor plan with all data and calculations on-site! 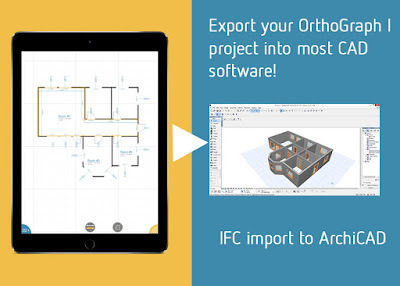 By using OrthoGraph I., you build BIM models, which can be exported into the main large scale desktop file formats (IFC, DXF) with just a simple touch From now on, you will be able to export your IFC files into more IFC reading software. This feature is a great help you to make an accurate architectural floor plan in reduced time. The new display of measurements provides you with a more professional way to oversee your projects in DXF file format. Share your OrthoGraph I projects easily! From now on, after you have chosen the right export format you need, you can share your projects in more ways: send it via Dropbox, Google Drive or many different professional ways etc. Connect you compatible laser distance meter to your mobile device and make all measurements in minutes. The new, auto-reconnect function will make your LDM available immediately, without any manual settings. From now on, all laser distance meter brands are managed under the same menu. 3D walkthrough is a popular feature among OrthoGraph I users. Make a great presentation to your clients or just see your project in a more realistic way – the material and lighting improvements make your project’s 3D view more professional. 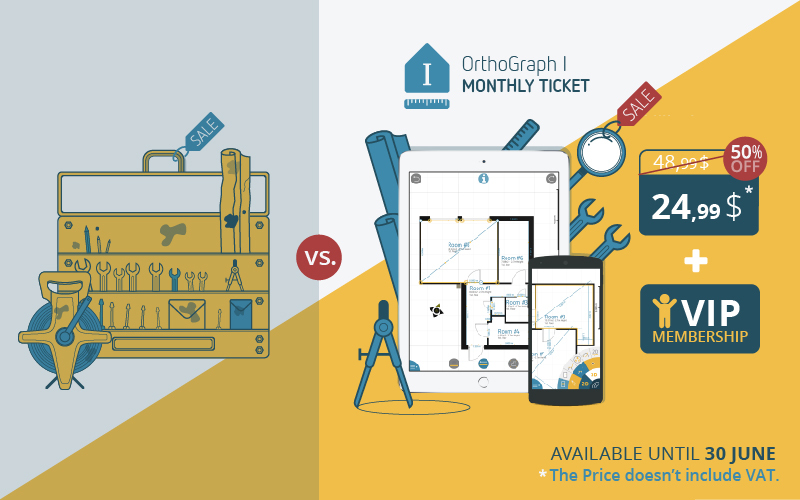 Upgrade your existing app, or download OrthoGraph I for free! To enjoy all benefits of OrthoGraph I subscribe for it! Click here to see all services you get by purchasing a license. 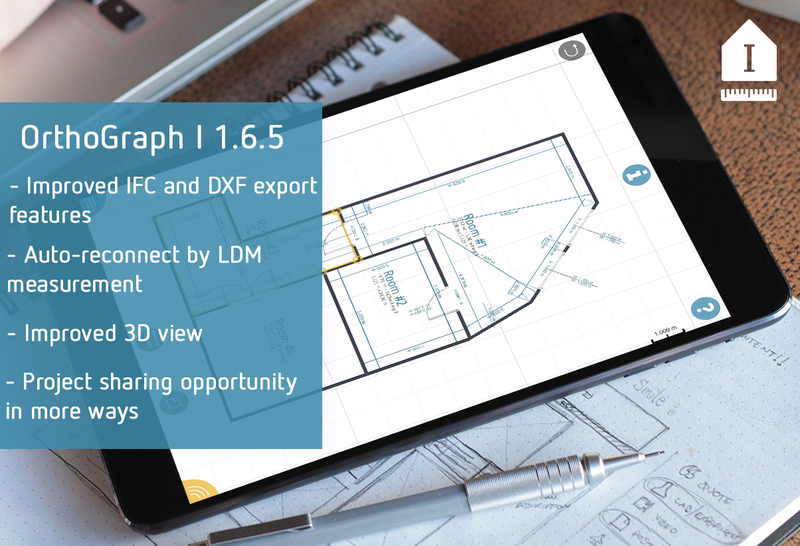 The new version of OrthoGraph I (1.5) is available! Our building survey software, OrthoGraph I is a floor plan survey and creation CAD app running on iOS and Android mobile devices. The app contains all essential features, which are needed to manage an accurate, professional and fast building survey on-site. We are proud of the fact that the core of OrthoGraph I’s success is that we constantly listen to our users’ demands and we never stop developing new functions. Now we have finished new improvements again to make a more user-friendly and versatile app available for you. Try it today! From now on, OrthoGraph I is compatible with Bosch GLM 50C and 100C laser distance meters, too. All supported LDMs are: Leica Disto E7100i (D110), D810 touch, D510 (7500i), S910 , D2, Bosch GLM 50C and 100C. Are you working on a project, containing a large number of locations? It isn’t a problem anymore! Thanks to OrthoGraph I’s improved functions you can easily handle large and complex projects, too. Make building surveys faster than ever; start using the improved functions today! 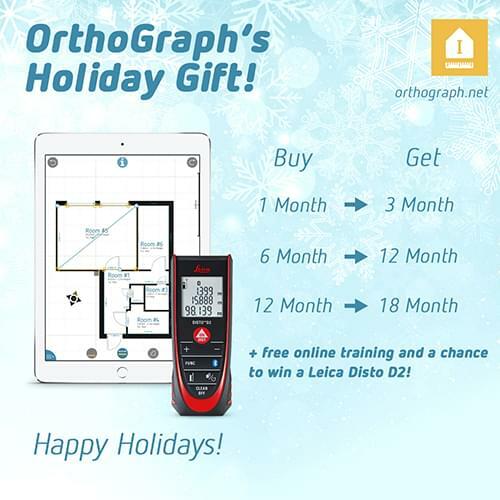 Do you want to get an OrthoGraph I and Leica Disto D2 package for free? Send us a screenshot from your project! 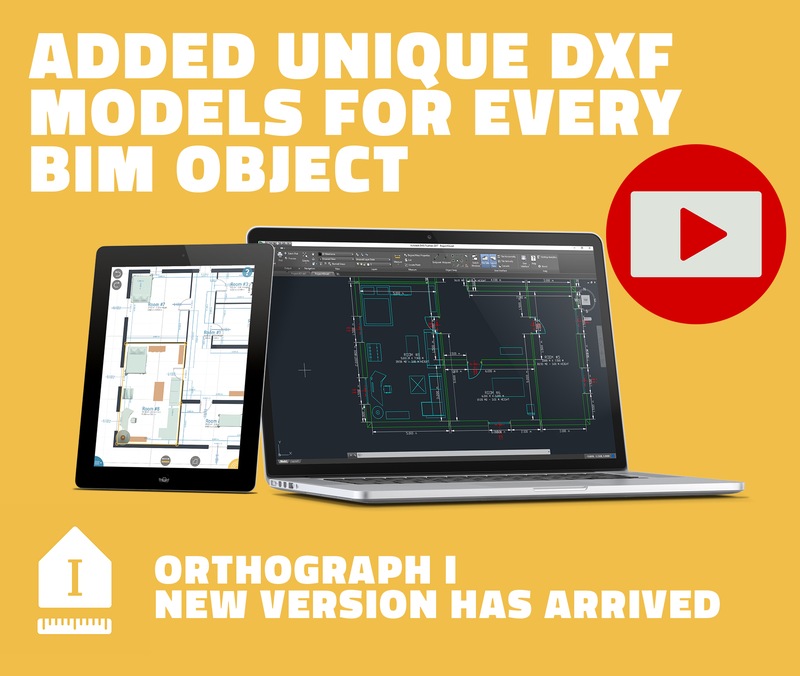 The new version of OrthoGraph I is available! 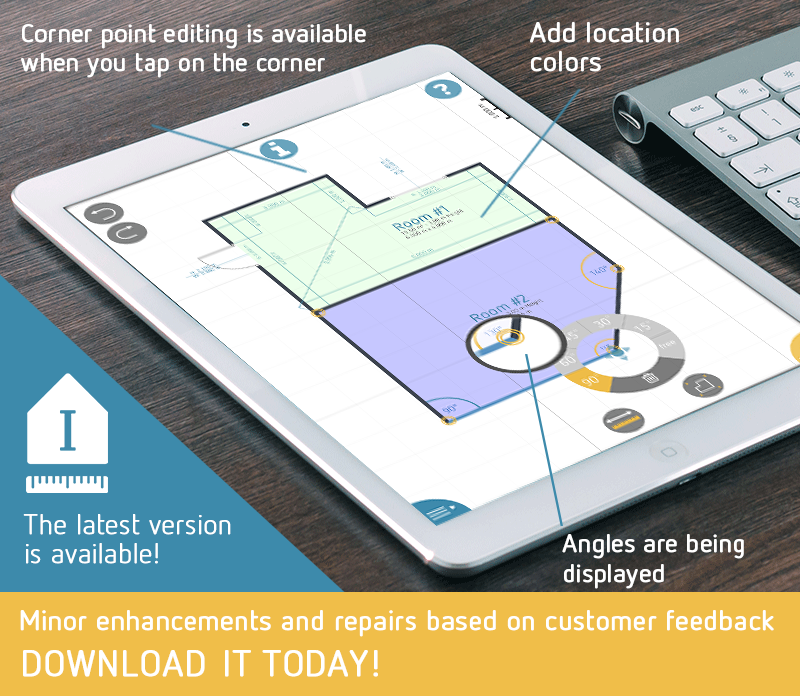 Try the award-winning building survey app today! OrthoGraph I’s latest version is available in the AppStore and Google Play now! Upgrade your existing app or start using it today in order to utilize all benefits of the most advanced building survey technology. In the new version you can add location colors to help differentiate your rooms in 2D view. From now on, you can easily overview even your complex projects too. Make all measurements in the most accurate way by the enhanced laser distance meter support. To manage a highly precise work easily, angles are being displayed by moving corner points. Several UI elements have been optimized for the simpler use: corner point editing isn’t a separate tool anymore, it’s available directly when you tap on your room’s corner! Furthermore, room properties and measurements can be found on the same screen. Minor enhancements and repairs based on customer feedback. Are you curious about OrthoGraph I? Ask a free demo by clicking here. Use your OrthoGraph I project in your CAD software I.
OrthoGraph I is one of the most advanced building survey tools on the market – and as a professional app, it can make your work much more easier and faster with its unique features. OrthoGraph I handles several BIM (Building Information Modeling) properties, such as complex hierarchical location structures, doors and windows with opening directions and properties, walls with attributes, moreover, you have over 100 intelligent objects to represent the equipment and machinery of the built environment. All this complex BIM data can be exported directly from your mobile device into IFC and DXF files, which can then be used in several CAD and BIM software platforms. In the following weeks we would like to introduce those CAD software products, which are compatible with OrthoGraph I. We will show you all those steps, which are important to be known for the successful work. Let’s start with ArchiCAD, which is in one of the most popular CAD software among architects. Now take a look at the simple process by clicking here! Do you want to use OrthoGraphi I’s full-functionality version for free? 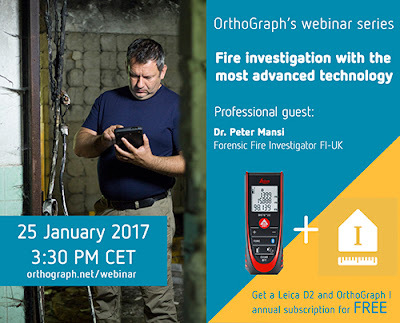 Take part on our next webinar and get an annual OrthoGraph I subscription and a Leica DISTO D2 package for free! Wishing Happy Holidays for the Industry! As winter holidays are coming, we would like to give a present to everybody creating building surveys and interested in using OrthoGraph I, our award-winning, multi-platform building survey application. What is our present to you? Since we have launched OrthoGraph I, more and more professionals started to use our building survey app. So we have decided to give some support for everybody, who would like to utilize all benefits – project saving, different export opportunities, on-site report, 3D walkthrough - of OrthoGraph I during on-site work. Subscribe for the monthly, half-yearly or yearly license and we give a license extension as a gift! If, for instance, you buy a 1 month subscription, we slap another 2 months to your order, free of charge. Moreover, if you buy a yearly subscription until 31 December, you can get a chance to win a Leica DISTO D2! The winner will be announced on 3 January 2017 on our Facebook and Twitter page, and we will send an email for the winner, as well. Furthermore, we give you a free online training in the value of 150 Euro, whichever of the above license types you take. On the training – which is conducted live online – all benefits of the app will be shown. The offer is available until 31 December, 2016. Don’t miss this chance to get the leading BIM CAD app! © 2012 OrthoGraph. All Rights Reserved. Powered by Blogger.